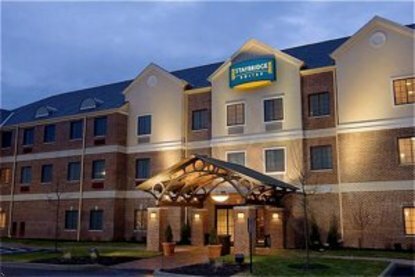 Northeast Ohio visitors who are in need of extended stay accommodations are encouraged to keep the Staybridge Suites Akron-Stow-Cuyahoga Falls in mind. In addition to offering proximity to Akron, Stow, and Cuyahoga Falls, this upscale extended stay hotel is within easy reach of Canton and Cleveland. The location is convenient for many different reasons and can help guests make the most of their stays. A great location isn’t the only reason to find favor with the Staybridge Suites Akron-Stow-Cuyahoga Falls. The hotel offers tastefully decorated suites and general areas, and there are wonderful facilities and amenities to take advantage of. Among the facilities figure such things as an indoor pool, free self-laundry machines, a well-equipped business center, and a fitness center. In the suites, the available amenities include flat screen TVs, large work desks, full-service kitchens, and a host of other inviting things. Basically, the guest units are more akin to apartments than they are to hotel rooms, and guests get the added advantage of enjoying access to hotel-like facilities and services.